The Tatmadaw called in air strikes yesterday as fighting between government troops and four ethnic armed groups continued at several locations across four townships in northern Shan and Kachin states, according to a spokesperson for the Ta’ang National Liberation Army, a member of the ethnic alliance. 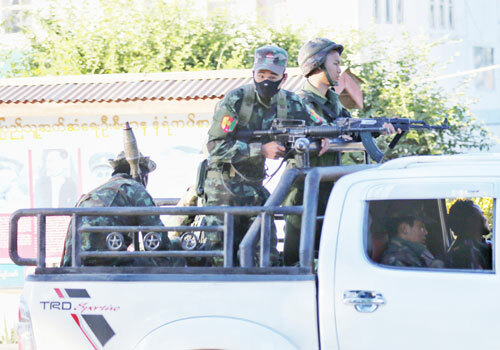 Colonel Mong Aik Kyaw of the TNLA said clashes were reported in Namkham, Muse and Kutkai townships in northern Shan State, as well as Bhamaw/Bhamo township in Kachin State. He said air strikes were launched in at least two locations, though he did not know specifically where. A response to the November 20 offensive by the four groups and its aftermath from the Union-level government came yesterday in the form of a statement from Daw Aung San Suu Kyi in her capacity as chair of the National Reconciliation and Peace Centre. “At a time when people of Myanmar are in process of striving for national reconciliation and peace that had remained elusive to them, it is extremely disappointing and saddening that these incidents are instigated,” read her statement. It condemned “taking up arms to solve political issues” and urged all ethnic armed groups to join the 21st-century Panglong Conference – Daw Aung San Suu Kyi’s rebranding of the formal peace process initiated under her predecessor government – by signing the nationwide ceasefire agreement(NCA). In a statement yesterday, the Kachin Independence Army elaborated on why it and the three other ethnic armed groups had staged their November 20 attacks on several police and military outposts in Shan State’s Muse and Kutkai townships. A joint statement earlier this week had referred to the four groups – the KIA, the TNLA, the Myanmar National Democratic Alliance Army and the Arakan Army – as the “alliance of the Northern Brotherhood”. The KIA statement said the alliance’s troops would be careful to avoid civilian casualties in the conflict zone. For its part, the Tatmadaw has vowed to “fight back” in the wake of the November 20 offensive. But others, including the Shan Youth Network, the Shan State Peace Task Force and other locals CSOs have demanded an end to the fighting, urging all warring parties to come to the negotiating table for a political dialogue. Reaction to the offensive and its aftermath has been mixed. “That isn’t the way to get real peace. Mutual honesty, understanding and a genuine desire for peace is needed. We hope the government forms a peace dialogue that can lead to real national reconciliation through magnanimity,” he added. Yangon School of Political Science chair U Myat Thu said the instability in Shan State and more broadly was a structural dilemma. “The problem is that the power of the government and the Tatmadaw is separate. The government cannot order the Tatmadaw,” he said. U Myat Thu pointed to more than five years of war in Kachin State – which has displaced more than 100,000 people – as motivating the recent offensive for the KIA. None of the four members of the Northern Alliance is an NCA signatory, and the TNLA, the MNDAA and the Arakan Army were effectively shut out of the peace process by the previous government, with their status in terms of future participation unresolved. A date for the meeting has not yet been set. Over the past four days, 2600 people have been displaced and are sheltering at monasteries in the town of Muse, while over 3000 people have fled across the border into China. The fighting has killed at least 10 people and injured more than 30.